So I retrieved the award from the hotel this afternoon :-) Here it is, in all its glory. 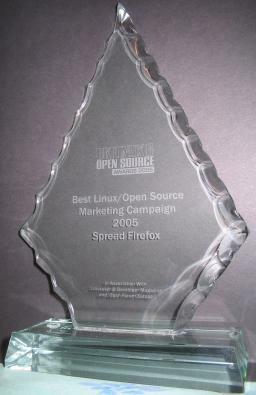 Congratulations to everyone who is a part of SpreadFirefox (or “Spread Firefox”, as the award puts it). The small writing which you can’t read on the low-res photo I uploaded says: “In Association With Linuxuser & Developer Magazine and, Open Forum Europe” (sic) – a sentence with three mistakes in, which must be some kind of record for a trophy. It’s going to sit on my shelf for now unless anyone can think of something better to do with it. Suggestions involving blowtorches will be politely ignored. Update: that last paragraph was a (poor) attempt at humour, prompted by my recollection of the blowtorch incident from Microserfs, and wasn’t intended to imply any disrespect towards the award or the organisers. Rereading it, that might not have been exactly clear. By “something better to do with it”, I actually meant “someone more appropriate to give it to” – as you know, I’m not heavily involved with SpreadFirefox. It would much rather it sat on the shelf of someone who had earned it rather than mine. I’m seeing https://bugzilla.mozilla.org/show_bug.cgi?id=263776 again with this post (in case anybody else is wondering about this). It happens when focusing the link in the post. Suggestions involving blowtorches will be politely ignored. att: some nobody — i totally don’t understand what you mean. what is your hostility directed towards? did you post this on the wrong blog or something? @Martijn, me too. Firefox 1.5 Beta 2, maximized in 1152 × 864. Please: no hostility intended. I’ve just heard more gracious acceptance speeches. Haven’t you? I don’t normally play amateur etiquette police. I just see SpreadFirefox in a slightly vulnerable position this week, and I don’t want to see “poor winner” attached to its diligently earned, once shining reputation. If I’ve expressed that poorly, my apologies. @Martijn and minghong: it works for me both in 1024 x 768 and full sized (1280 x 1024) in beta 2. However, the bug is still valid with the testcase and the other url. I meant that the bug still exists with the given testcase.